The Prime Minister Theresa May is in Norway for a day of meetings with her Scandinavian counterparts at the Northern Future Forum in Oslo. Brexit is bound to come up in conversation, so it feels like a good day to remind ourselves what the Norway model is. Since the referendum, Norway has been discussed as one possible Brexit solution because a) it is not a member of the European Union, but b) it is in the European Economic Area (EEA), which means that it's also part of the single market. So it's about as close to the EU as you can get without being a member state. And, if the UK followed this example, that would mean its trade relations with its nearest neighbours could remain pretty much as they are now. How do you get into the EEA if you're not in the EU? Alphabet soup alert. You have to join EFTA - the European Free Trade Association, which groups four countries together: Norway, Iceland, Liechtenstein and Switzerland. Just to complicate things further, Switzerland has chosen not to join the EEA, and relies on a series of complex agreements with the EU instead. So what does EEA membership mean in practice for Norway? It means Norway has full access to the single market, and very limited barriers to trade with the EU. In return it makes substantial contributions to the EU budget, and has to follow most EU rules and laws. These include the so-called four freedoms - the freedom of movement of goods, services, capital and people. That means people from across the EU are free to live and work in Norway, and Norwegians can live and work across the EU. But Norway has no formal say in making EU rules, because it has no representation in any of the main European institutions. Norway is not part of the EU's Common Agricultural Policy (CAP) or the Common Fisheries Policy (CFP). So it can set its own policies in those areas. It is also exempt from EU rules on justice and home affairs. Norway likes to go its own way, then? Yes. That sounds familiar doesn't it? Of course it helps when you have one of the largest sovereign wealth funds in the world, thanks to huge investments generated by oil and gas revenues. Fishing and agriculture are also big issues in rural Norway (fishing is one of the biggest industries in the country) so being outside the CFP and the CAP are important indicators of national sovereignty. 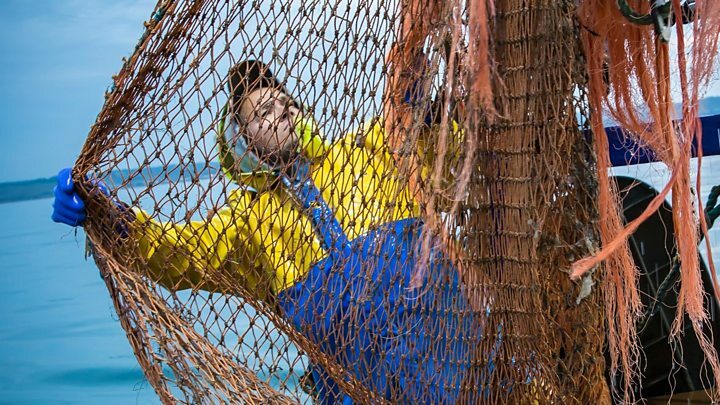 Media captionReality Check: Fishing after Brexit - sink or swim? Norway's not in the customs union either, is it? That means it does need to take some additional administrative steps in order to trade with the EU. But it also means it can sign its own trade deals with other countries around the world. However, being outside the EU customs union means a relationship like Norway's would not solve the thorny Brexit problem of avoiding a hard border in Ireland. To keep the Irish border as open as it is now, you would need to add a new customs union (or equivalent arrangement) with the EU - a "Norway plus" solution, if you like. But the prime minister has already ruled out the Norway model, hasn't she? She has. And she has pledged to leave both the single market and the customs union. Some MPs, though, have recently argued in favour of a short-term 'Norway for Now' option. Instead of a transition period after Brexit, it would see the UK joining the EEA (via EFTA) for three years, and agreeing a temporary customs union with the EU. That would, the theory goes, give the UK time to negotiate a free trade agreement with the EU for the future. How would the EEA countries feel about that? EEA membership would certainly be on offer as a long-term solution after Brexit. But it's unlikely that Norway and friends would want to be used as a waiting room on the UK's route out of the EU. 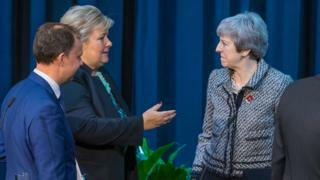 "I don't think it's easy to think that you can enter into an organisation you are preparing to leave at the same time," Norwegian Prime Minister Erna Solberg told the Northern Future Forum. "It is also a little bit difficult for the rest of us." Logistics and the law would pose a problem as well. There is neither time nor legal authority before 29 March 2019 for the UK to apply to join EFTA and then rejoin the EEA. As things stand, EFTA states are also not allowed to be in a customs union with the EU. So Norway (or something like it) is off the table? In the government's mind it is. Theresa May said in Oslo today that Norway's existing relationship with the EU "has elements that wouldn't deliver on the vote of the British people." But these are uncertain times. If a Brexit deal were to be agreed with the EU, and then voted down in the House of Commons, all bets would be off. And all options (including some version of Norway) could be up for debate.